Two items caught my eye today. World oil prices reached $93 a barrel this week, which is why gasoline at the Wesco down the road is $3.07-a- gallon tonight. The other news is the announcement on Monday that city leaders in Oregon want to dramatically expand the number of neighborhoods served by Portland’s spectacularly successful streetcar. The two developments are related, of course, because as fuel prices rise the sanity and fuel-efficiency of streetcar lines makes ever more sense. Dallas opened a 2.8-mile streetcar line in 1989, and since then eight cities have built new streetcar lines, including Memphis, Little Rock, San Francisco and Tampa, all serving growing numbers of riders using restored cars or replicas. Portland, which opened the first section of what is now an eight-mile loop in 2001, was the first to use modern streetcars, designed and built in the Czech Republic. 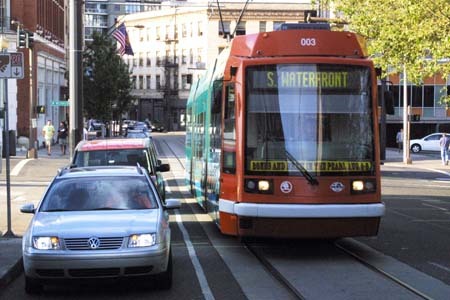 A new 2.6-mile streetcar line is scheduled to open in Seattle in December; a new line is to open in Washington in 2009; and a four-mile line is to begin operating in Tucson in December 2010. Miami, Columbus, Cincinnati, Phoenix, Missoula, Grand Rapids and some 70 other American cities are studying the feasibility of opening lines, according to Reconnecting America, a national nonprofit transit research group in Oakland, Calif.
Not since the turn of the 20th century, when metropolitan regions built elegant urban-rail networks, which were later dismantled, have streetcars generated such intense interest, according to the American Public Transportation Association, a Washington trade group. Much of the reason lies in what happened after Portland decided that a streetcar, operating on fixed tracks and sharing the right of way with cars, was not only a new option for getting from one end of town to the other, but also a boon to developers as a new rail corridor for building homes and offices downtown. The Portland region also has a 44-mile network of light-rail lines, using faster and larger cars, that runs through the center of the city to the eastern and western suburbs. An 8.3-mile, $575.7 million extension is under way, scheduled to open in 2009. The city-owned streetcar line, which cost $100 million to build, has helped sweep in $2.4 billion in new commercial and housing development, with 7,248 new housing units, according to city statistics. A former vacant railway yard and grimy light-industrial sector on the line’s northern end was transformed into a hip area called the Pearl District. On the other end, industrial ground along the Williamette River has become the South Waterfront, a neighborhood of high-rise condominiums, town houses, offices, parks and a tram with spectacular views. Although riding the Portland streetcars now seems like a logical step to urban prosperity, getting the line built took 11 years of promoting the idea. A major task included convincing residents that pedestrians, bicyclists, drivers and streetcars could co-exist in the same right of way. Miami, which plans to open a line in 2012, put the problem to rest by producing videos of Portland streetcars as they operate without a hitch, and posting them on a Web site, miamigov.com/MiamiStreetcar/pages/Videos.asp. Another challenge was raising money. Portland financed its line almost entirely with local taxes. Two years ago, Earl Blumenauer, Democrat of Portland, convinced his colleagues in the House of Representatives to approve a new funding provision called Small Starts in the federal transportation bill to help pay for the line. This year the program is providing $100 million for building streetcar lines and bus rapid transit systems. Portland wants to use $75 million in Small Starts money to partly finance a 6.7-mile, $146 million extension of its streetcar line. According to the Portland Oregonian, about 140 miles of the city’s busiest streets show potential for new streetcar routes. Streetcars could make more neighborhoods resemble the popular retail corridor along Southeast Belmont, built originally along a streetcar line in the early 20th century.